Alligator meat is the meat from alligators that is for consumption. It has been used both historically and in contemporary times in various cuisines of the Southern United States. Alligator eggs are also for consumption. 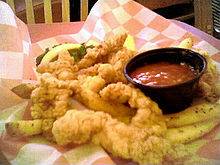 Alligator meat has been described as a healthy meat source for humans due to its high protein and low fat composition. It has been described as being mild flavored and firm in texture. 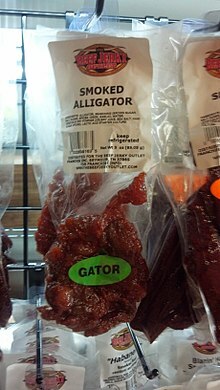 In the United States, it can only be legally sourced from alligator farms, and is available for consumer purchase in specialty food stores, some grocery stores, and can also be mail ordered. Some U.S. companies process and market alligator meat derived only from the tail of alligators. Alligator meat consists of 143 calories in a 3.5 ounce serving, 29 grams of protein, 3 percent fat and 65 milligrams of cholesterol. It also contains a significant amount of phosphorus, potassium, vitamin B12, niacin and monounsaturated fatty acids. , with a mildly fishy flavor, and is often chewy, depending on preparation. Various methods of preparation and cooking exist, including tenderization, marination, deep frying, stewing, roasting, smoking and sauteeing. Alligator meat is used in dishes such as gumbo, and is used in traditional Louisiana Creole cuisine. Cuts from the animal used include meat from the animal's tail and backbone, which have been described as "the choicest cuts". In the mid-1800s, alligator meat was used in some regional cuisines in parts of the Southern United States. During this time, it was used in dishes such as gumbo. 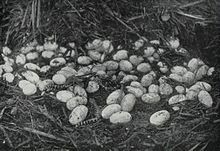 Alligator eggs were a part of the cuisine in many areas of the Southern United States in the early 1900s. During this time people would harvest the eggs and then sell them as a source of income. Harvesting of wild alligator eggs is illegal without a proper permit; violators face serious fines and jail time. ^ "IFIS Dictionary of Food Science and Technology – International Food Information Service". Books.google.com. 2009-05-26. Retrieved 2017-03-13. ^ "Marine and Freshwater Products Handbook". Books.google.com. Retrieved 2017-03-13. ^ a b c d "Miami Spice: The New Florida Cuisine – Steven Raichlen". Books.google.com. 1993-01-11. Retrieved 2017-03-13. ^ a b c Cincinnati Magazine. June 1986. ^ a b New Orleans – Pableaux Johnson, Charmaine O'Brien. p. 50. ^ "What Do Snake and Other Exotics Meats Taste Like". The Daily Meal. January 22, 2015. Retrieved 2017-03-13. ^ a b Producing Meat – Rachel Lynette. pp. 28-29. ^ a b "Alligator – Richard Spilsbury". Books.google.com. Retrieved 2017-03-13. ^ a b The Alligator and Its Allies – Albert Moore Reese. 1915. pp. 35-36. ^ "FWC uncovers illegal alligator egg-harvesting operation". 24 May 2017. ^ "Alligator Hunting Regulations Overview | Louisiana Department of Wildlife and Fisheries". Wlf.louisiana.gov. Retrieved 2019-03-12. ^ "Alligator — Texas Parks & Wildlife Department". Tpwd.texas.gov. Retrieved 2019-03-12. The Culinary Herpetologist. p. 132. Leak, Fred W. A Further Analysis of Florida Alligator Meat as a Wholesome Food Product. Florida Department of Agriculture and Consumer Services, Division of Marketing.